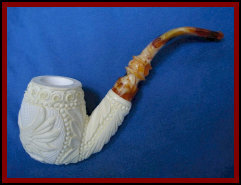 Meerschaum Pipes are normally made from a material named sepiolite (hydrous magnesium silicate) that occurs naturally in Turkey and some of its surrounding countries. This material is easily carved, however it can crack just as easily. Usually, the bowl of the pipe is made of this material, but the stem of the pipe is made of carved amber and screwed together using a bone screw. When the pipe has been smoked for a long period of time, it takes on a deep red (almost maroon) color.